It’s the holiday season in Apple Harbor, and in the spirit of giving, the Barnes family — Charlie, Pop-Up, and Farmer and Mrs. Barnes — launch a charity drive for children in need. As always, Dumpy is ready to help, and soon his dumper is filled with gifts. But what starts as a local effort soon becomes an adventure with international impact. 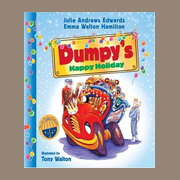 This festive addition to the popular Dumpy the Dump Truck series demonstrates that when hearts are in the right place, opportunities and solutions will surely follow . . . and that giving brings its own rewards.